Ask about our 'ditch your device' campaign. Willing to sacrifice your devices for the weekend? Dreaming of some time away with the one you love in private and very relaxing surroundings? Eagle View Escape is under three hours from Sydney, west of the Blue Mountains and has an enviable reputation for making our guests feel special and instantly at home. Eagle View Escape is a stunning 100 acre property just 30 minutes west of the Blue Mountains - the perfect place for a romantic getaway. Select from our five styles of boutique, self-contained accommodation, tailor made for your romantic escape. We offer a warm welcome, comfortable secluded accommodation and scrumptious freshly prepared food & hampers using local produce wherever possible. Each room features a large double spa, queen bed, gas fire, deluxe ensuite bathroom, private balcony, Flat Screen LCD TV, DVD/CD player. Variety of scrumptious food hampers on offer. Eagle View Escape is perfect for a romantic retreat with your someone special. Catering exclusively for couples, we provide all the seclusion and comfort you need for a romantic getaway with your someone special. Check out Trip Advisor for what our guests say about their romantic getaways at our Blue Mountains retreat ... Just follow the link from our Home Page. 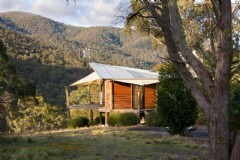 Eagle View Escape is just a short drive over the Blue Mountains 2.5 hours from the Sydney CBD. Follow the M4 Motorway and Great Western Highway until you reach the Lithgow Coles Express Shell Service Station and then turn left onto Magpie Hollow Road. Follow this road until the very end (approximately 11km). At the intersection turn right onto Rydal Road then take the next street on the right after approximately 1.5km, Kimbri Drive. At the end of Kimbri Drive (150m) turn right and follow the driveway for approximately 3km to the main reception building. Please take extra care and be on the lookout for crossing wildlife on the drive! Escape the city with that 'someone special'. Let us spoil you with an array of scrumptious dinner hampers. Why not organise a beautiful chocolate fondue, champagne and strawberries for that added indulgence and to top it off this could all be experienced from our deep luxurious spa's with the spectacular view over Lake Lyall. Call today and speak to one of our friendly staff to secure your romantic getaway! Weekends incur a minimum 2 night stay policy. 1 night weekend rates available on limited request. Guests are required to make a guarantee on all bookings. Credit Card, Bank Deposit, Cheque or Money Order accepted. Your details will be emailed directly to Eagle View Escape. Please check your contact details are correct. Complete your details below and your enquiry will be emailed directly to Eagle View Escape. Please check your contact details are correct to ensure the quickest possible reply.